Easter is right around the corner, and with Easter comes lots and lots of peeps. I'm pretty sure that peeps are like the candy icon of Easter. When I think of Easter baskets and the yummy treats that may be inside, I can't help but picture peeps! Honestly, who doesn't? Growing up there was always a plethora of peeps to be found in our Easter baskets. I've always thought peeps were ok- they were never my very favorite candy but I liked them well enough. But then one fateful day my mom discovered that when you open the package and let them dry out for a few days- they become really chewy and suddenly they become so addictive. Seriously, I just love that texture! Thinking about this variation of eating peeps inspired me to look around and find some other creative ways to eat Easter peeps. Not only are they yummy, but some of them are so cute as well! *Make colorful rice krispie treats. 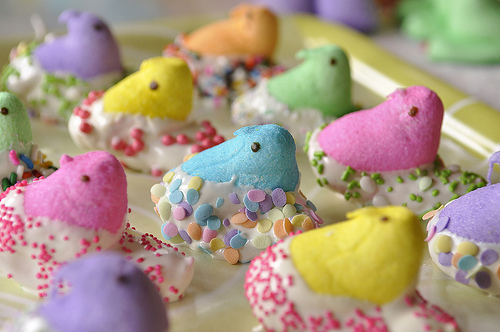 Rather than using plain old marshmallows, give your treats a little color and use peeps instead. *Dip in chocolate. Okay, really everything is better with chocolate, right? But I think marshmallows in particular are so yummy dipped in chocolate. You could even make them into cute little mallow pops for party favors or to put in Easter baskets. Add sprinkles, caramel, mini marshmallows, chopped nuts, M&M's or anything else that tickles your fancy. This could also be a fun idea to do with little ones for an Easter party activity. *Make peep pops. You could just put a peep on a stick- or you could get creative; use a pretzel rod for a stick, stick it to a brownie or rice krispie treat before putting on a stick, or make a peeps kabob by adding a whole row of peeps to a stick! *You could make marshmallow cookie sandwiches, and make the peep look like its peeking out of the cookie- such a cute way to eat them, don't you think? *Make colorful popcorn balls. Melt some peeps in a skillet with a little butter and pour over some fresh popped popcorn. Let it cool and enjoy that crunchy-mallow goodness! *Make s'mores. It's starting to warm up outside, why not go up the canyon for a campfire, and bring those peeps buddies with you? *Make hot chocolate- I love the taste and texture of marshmallows melting in my hot chocolate- what could be better than a giant peep?! 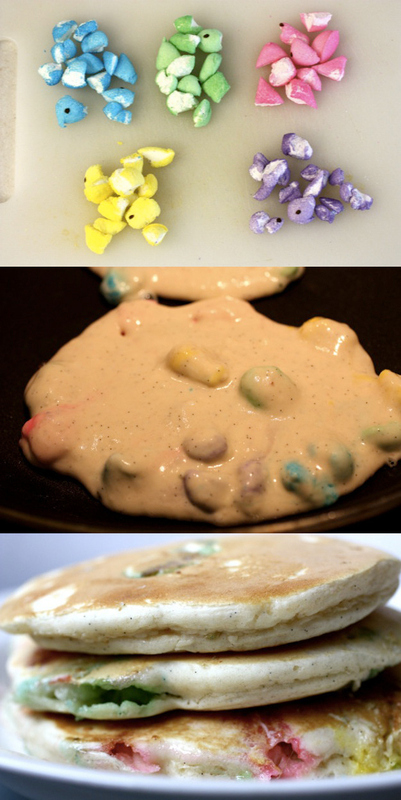 *Use in pancake batter to make Peepcakes. This could be a fun and easy way to have a festive breakfast Easter morning. 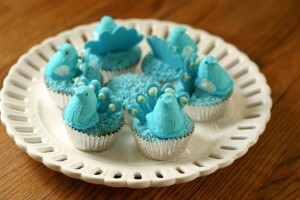 *Put peeps on cupcakes. You could do so much with this one as well! You could dye coconut green and place a bunny peep in the 'grass', or you could dye the coconut brown or even use pretzel sitcks and put a bird peep on top of a cute little nest! One cute idea I found turns the peeps into peacocks! 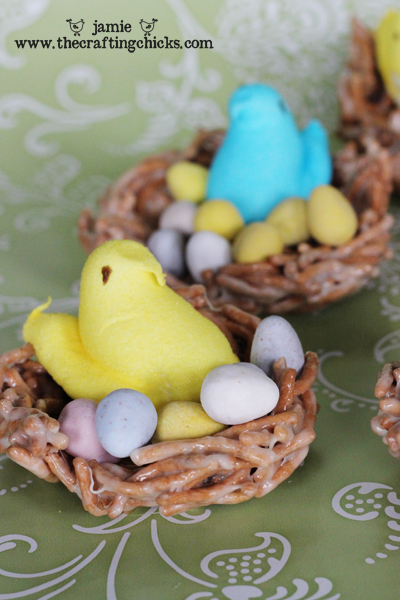 Really, you could use peeps as a cute decoration to any dessert you make. They would be adorable placed around a cake, on top of a pudding or pie- it's hard to go wrong with these cute marshmallow treats! 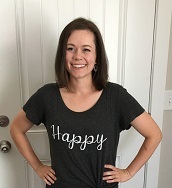 I would love to hear of any other variations you have enjoyed!